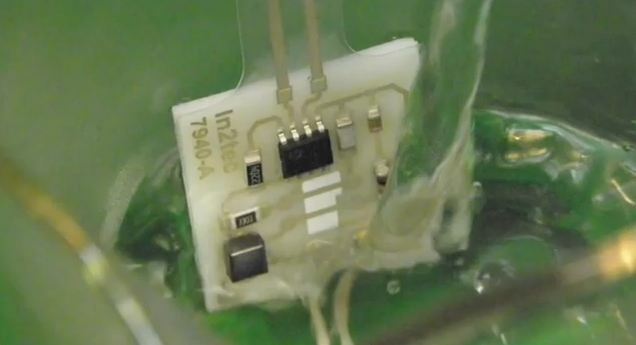 The National Physical Laboratory (NPL), along with partners In2Tec Ltd (UK) and Gwent Electronic Materials Ltd, have developed a printed circuit board (PCB) whose components can be easily separated by immersion in hot water. The project partners designed, developed and tested a series of unzippable polymeric layers that allow the assemblies to be easily separated at end-of-life into their constituent parts, after immersion in hot water — while withstanding prolonged thermal cycling and damp heat stressing. This revolutionary materials technology allows 90% of the original structure to be reused. For comparison, less than 2% of traditional PCB material can be reused. The work was part of the ReUSE project, funded by the UK government’s Technology Strategy Board. The aim of the ReUSE (Reuseable, Unzippable, Sustainable Electronics) project was to increase the recyclability of electronic assemblies, in order to avoid an ever-growing volume of waste. The electronics industry has a waste problem — currently over 100 million electronic units are discarded annually in the UK alone, making it one of the fastest growing waste streams. Around 85% of all PCB scrap board waste goes to landfill. Around 70% of this being of non-metallic content with little opportunity for recycling. This amounts to around 1 million tons in the UK annually. The developed technology lends itself readily to rigid, flexible and 3D structures, which will enable the electronics industry to pursue new design philosophies — with the emphasis on using less materials and improving sustainability.